McALLEN – In the collegiate track and field world, when the University of Arkansas comes calling with scholarship in hand, that is the definition of a big deal. The Razorbacks are perennial NCAA champions. A powerhouse if there ever was one, having claimed 44 national titles including the women’s team indoor championship just a couple of weeks ago. Edinburg Vela’s Brendon Rivera, the 2015 Class 5A Texas high jump state champion, accepted Arkansas’ offer and spent three years with the Razorbacks and did well. The high jumper twice advanced to the NCAA preliminary round after qualifying in 2017 and 2018 after the Southeastern Conference Outdoor Track & Field Championships. Rivera, however, has traded crimson track suits and is now at the University of Houston, whose men’s team earned a third-place finish in the outdoor NCAA D-I championships in 2018 and have a long history of success. He joins several RGV athletes who compete for the Cougars’ men’s and women’s track teams – and nine-time Olympic gold medalist in Houston head coach Carl Lewis. The 6-foot-1 Rivera, who’s listed as a junior, has performed well in his first season with the Cougars. Rivera won a bronze medal in the American Conference Indoor Track & Field Championships on Feb. 22 with a 6-foot-11 leap. Also, he claimed first-place finishes in two other meets including the Houston Invitational. The Vela alum’s best leap on the college level was last year at an Arkansas home meet where Rivera cleared the bar at 7-0.25. Rivera was the 2015 Texas 5A state champion and once jumped 7-2 in high school. The outdoor track season began last week for most schools and runs through June. The NCAA Outdoor Track and Field Championships will tack place in Austin this year. Sophomore Allyson Rodriguez is following up a fantastic freshman campaign with a super sophomore year at Ranger Junior College. The right-hander, who plays several different positions in the field (primarily catcher), is batting .385 with 35 hits in 91 at bats. Rodriguez has 22 RBIs in 28 games played, and through last week, she was ranked third nationally by the NJCAA in doubles with 14. Rodriguez’s stellar performance in 2019 doesn’t stop there. Her four triples rank her 10th nationally and she also has three home runs. She sports a .725 slugging percentage and has helped Ranger win games by accounting for 66 total bases – including nine steals. Her fielding percentage is .901 with 91 putouts or assists in 101 chances. Matthew Rosales has made a change. A dramatic one, and for the better. The senior catcher has improved his batting average nearly 300 points by consistently making contact for Texas A&M International University in Laredo. If not for a late dip, Rosales would be batting in the mid .400s. Now, he’s at .397 with 25 hits, 16 RBIs, three home runs and seven runs scored for the Div. II Dust Devils. The 6-foot Weslaco High alum, who transferred from Laredo Community College after his sophomore year, has been a defensive stalwart both seasons at TAMIU. Rosales has delivered on 132 of 138 chances in the field (six errors) for a stellar .957 fielding percentage. Also, he’s thrown out nine runners attempting to steal for the 9-17 Dust Devils, who are about to begin conference play. Add Crystal Castillo to the list of RGV softball players doing well at the Div. I level. The junior pitcher from San Benito, as Prairie View University’s ace in the circle, is leading the Panthers with a 6-3 record. She sports a team-low 2.24 ERA while racking up 33 strikeouts and limiting opponents to .194 batting average. The 5-foot-3 Castillo has walked 21, but only has two wild pitches in a team-leading 56 innings pitched. What’s more, Castillo has picked up two saves and pitched seven complete games for 14-7 Prairie View. The right-hander has markedly improved on last year’s 8-7, 4.36 ERA marks. Perhaps her best outing was win over UTSA where she fanned eight and allowed two hits and two runs. 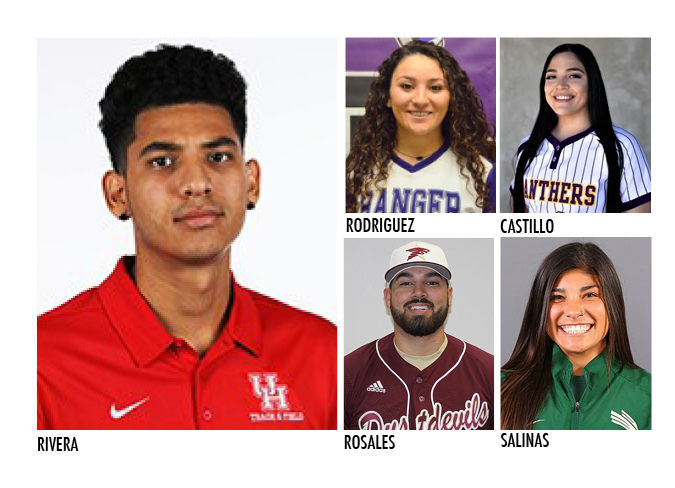 Castillo, an All-Valley MVP while at San Benito, was named SWAC First Team All-Conference in 2018. Sydney Salinas has literally raised the bar on her own success. The pole vault bar. The former Weslaco High track and field star, now competing for the University of North Texas, cleared 12 feet, 4 inches at the Conference USA Indoor Track and Field Championships in February. Her vault was good enough to earn her a fourth-place finish and four points for the Mean Green. In her freshman campaign, Salinas has consistently vaulted on the high end of 11 feet. At a Feb. 2 meet, she first cleared 12 feet. Then on Feb. 17 she posted an indoor personal best mark of 12-4. Although Salinas is focused on the pole vault at UNT, she was a decorated sprinter and ran the relays at Weslaco High while also competing in the pole vault and winning area as a senior with an 11-1 mark.